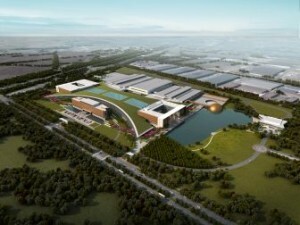 SmithGroupJJR, the 160-year-old architecture and engineering firm in the US, has opened an office in Shanghai, China. It will focus on several of China’s biggest growth markets: research and development, healthcare, continuing care/retirement communities, and higher education. The new office, located in the Puxi area of Shanghai, follows a number of significant projects SmithGroupJJR has designed in China in recent years, serving Chinese clients and US-based companies expanding their operations to China. In Changchun, the firm designed the new 468,000sqm automotive research and development center for First Automotive Works, China’s leading manufacturer of passenger cars and commercial trucks and buses. Now under construction, the project will be completed in 2015. Continuing care/retirement community design is another area of expertise successfully brought to China by SmithGroupJJR. Starting construction this fall in Shanghai is the 21-story ZhongShan Park, a continuing care retirement community SmithGroupJJR designed for the Vcanland Senior Living Group. SmithGroupJJR President & CEO Carl Roehling believes the growing healthcare market in China will help the firm succeed. “Clients are requesting the level of design expertise we possess,” Roehling said. “For the growing healthcare market in China, there is a need for firms that excel in healthcare design and the advanced technology used in hospitals. We have that expertise,” he added. In Shanghai, SmithGroupJJR designed Shuguang Hospital for Shanghai Traditional Chinese Medical University. The firm’s U.S. clients include the National Institutes of Health, St. Jude Children’s Research Hospital, Stanford University Medical Center, and Kaiser Permanente. As leader in sustainable design, the company has completed 91 LEED certified projects to date.